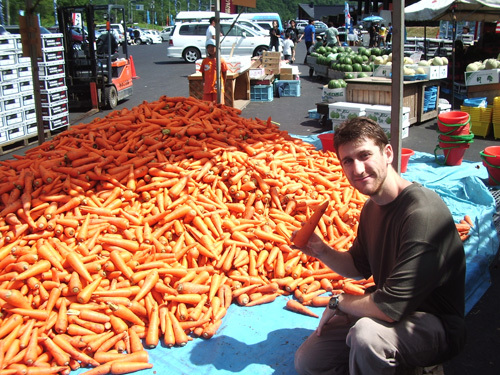 Here is a video of my summer adventures in Japan. The field I went to in Hokkaido was so beautiful not only because of the view but because of the entire atmosphere. It was amazing how the wind swept through as the shadows of the clouds constantly also ran across the field. Field Video (500K) No, it is not time lapsed. This summer I was not able to travel overseas, but I had the opportunity to travel to 2 places within Japan. Traveling in Japan is actually more expensive than if I traveled overseas, but it was also very interesting to further explore this country I live in. 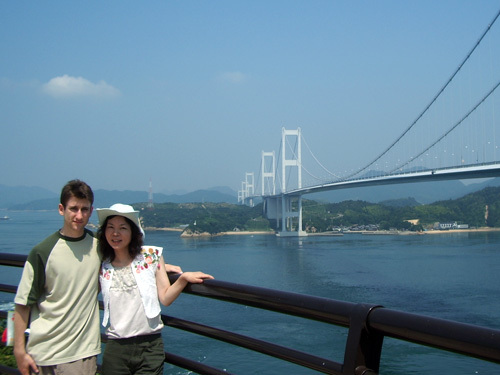 -Shimanamikaidou: These recently built bridges from Ehime to the mainland of Japan were quite amazing to look at. Also, if you come at the right time you can see natural whirlpools in the ocean beneath the bridge. 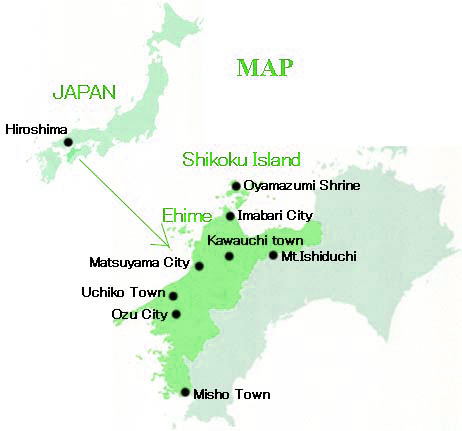 -Imabari Castle: A nice castle with a good view of Ehime’s natural features. 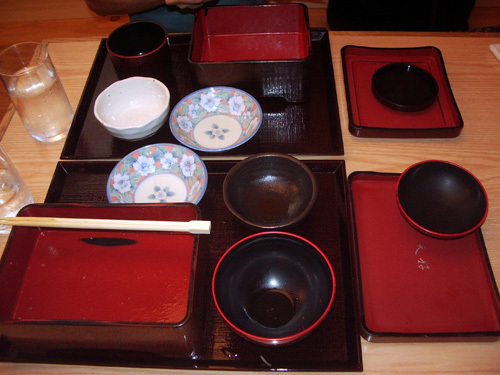 -Sushi: My friend’s uncle owns a sushi restaurant so we got to eat lots of really good and free sushi. 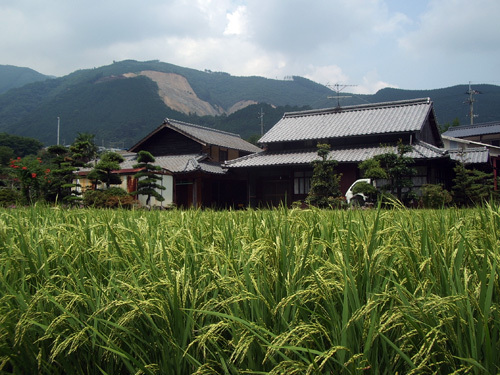 -Inaka: Which means countryside or away from the city. I stayed at one of my friend’s friend’s house which is up in the mountains and surrounded by rice fields and mikan trees. 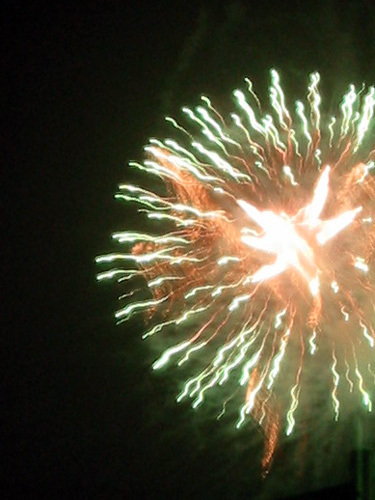 -Fireworks: We went to a fireworks festival in one of the small towns in Ehime. The fireworks were amazing as since it was a small town it was not very crowded, and we got to sit so close to the fireworks that the ash and cardboard came raining down on us. I enjoyed these fireworks much more than any in Tokyo where you sit far away and there are so many people that it is hard to even walk. 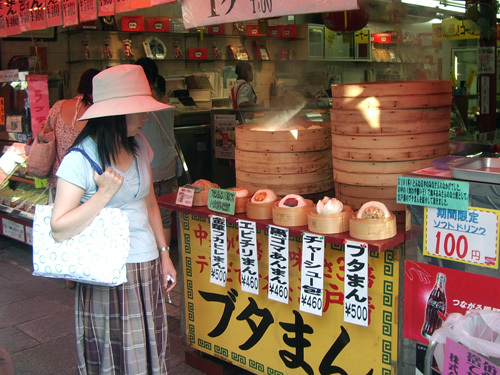 -Konpirasan and Udon: We took a trip to Kagawa to a place which is very famous for udon. 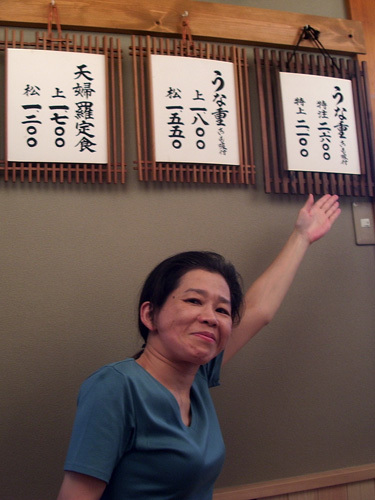 While there, we took an udon making class and made udon, after which we got to eat the udon we made for lunch. We then climbed up what seemed like endless steps to get to the temple at the top of the mountain. 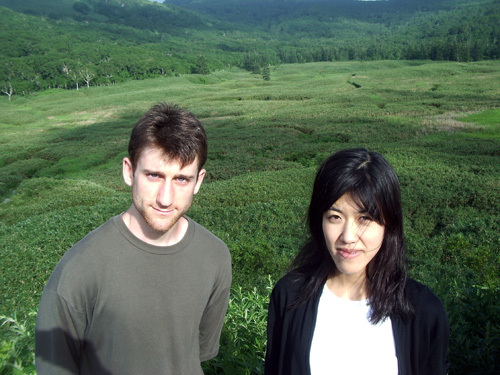 -Kamegamori: We took a drive up the mountains and went hiking along a beautiful path with so many green plants that it looked like a carpet. The drive was also quite fun as many parts of the road had washed out and we drove over what seemed like half finished bridges. -Mt. Ishizuchi: This has to be my favorite part of the trip. We climbed to the top of the highest mountain in Shikoku. 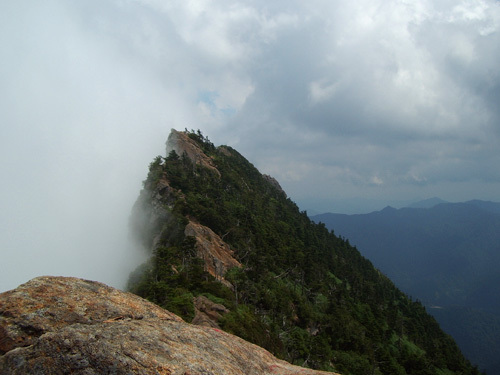 This mountain is not only amazingly beautiful, but also quite difficult to get to the top. There is a series of metal chains as you climb the rock face, sometimes at almost a 90 degree angle, to get to the top. Then to get to the very top of the mountain you have to walk along the ridge of the mountain where if you fall in either direction, it is a long way to the bottom. -Dogo Onsen: After climbing a mountain there is nothing better than to relax at an onsen. This is one of the oldest and most famous onsens in Ehime. There are a lot of good sweet shops around the area as well. 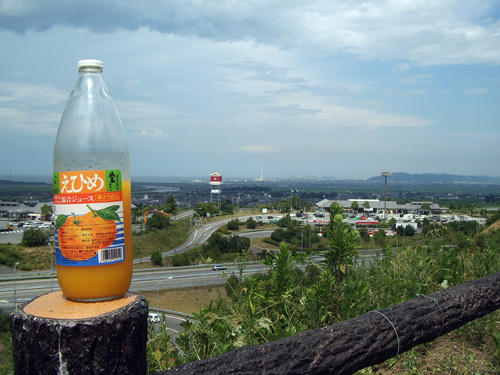 -Mikan Juice: Mikan is the most famous product of Ehime. I drank mikan juice almost every day as it was delicious and in abundance everywhere. 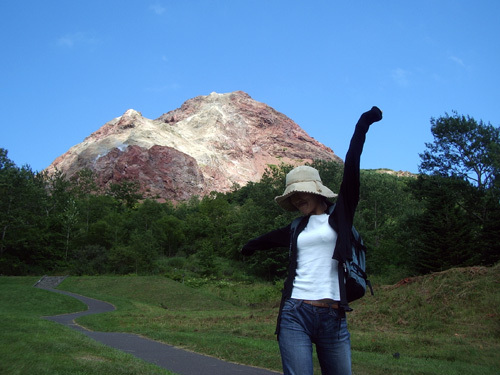 -Exploring in the car: Hiking to moss covered rocks, free mushroom soup, lots of carrots, the onsen colored river, showa shinzan volcano, beautiful lake, fighting with bears, big mountain, pristine field, sunset at the western-most point in Hokkaido, Otaru at night, Viking. -Otaru: I got to explore Otaru again but without all the snow and cold. I was amazed at how much I remember and also at how different it was. 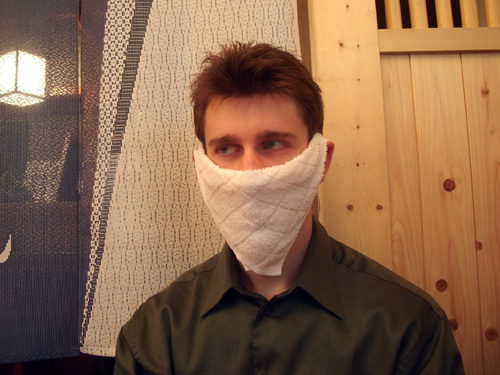 -Lakeside Osen: This has to be one of the absolute best onsens I have ever been to. Natural water coming out of the ground as you relax to an amazingly beautiful lake and mountain scene. -Sapporo’s parks: The parks are just as beautiful in the summer as they were in the winter, except with an abundance of life and not packed with tourists. 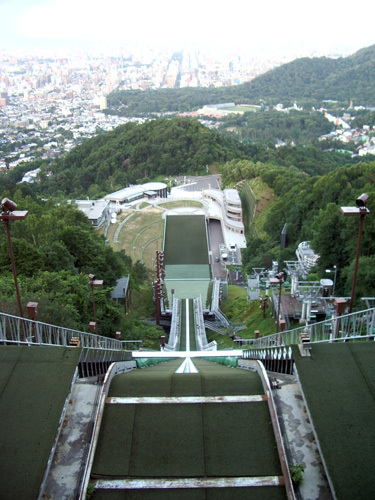 -Shiroikoibito Chocolate Factory and the OkuraYama Ski Jump: These are two places I went to in the winter as well but really wanted to come back to in the summer. The chocolate factory was the same as before except this time I understood a lot more of the Japanese and ate a lot more of the cakes and sweets. I was really happy to go back to the ski jump hill as well. When I was there in the winter it was snowing so I did not get a view of Sapporo. This time the view was amazing. 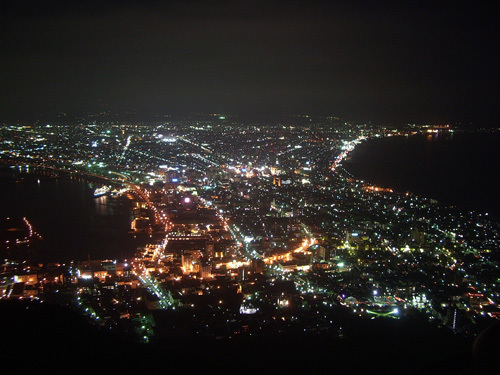 -Hakodate and Lake: In the morning we went to the morning fish market and then in the afternoon took a long bicycle ride around a lake a little north of the city. We had a lakeside picnic for lunch and back in Hakodate had some really good seafood for dinner. -Pentagon shaped fort thing: After a breakfast of Japanese sweets at a local shop explored the fort thing. We went to a museum in the middle of the fort and I got an English translation of the guide that was so full of misspellings and grammar errors that even I had a very difficult time understanding what it was saying. We also checked out the old churches and famous building before heading down to Aomori. -Aomori: To get to Aomori I got to take a train that went under the ocean. Surprisingly there were even some train stops under the ocean! 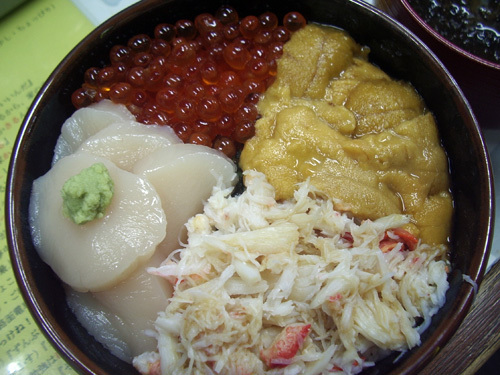 Aomori also had good and really cheap seafood. I got to finally stay in a capsule hotel! We then took a bus to a cable car and mountain hiking, followed by hitch hiking and another really famous onsen. Then ‘ekiben’ and shinkansen ride back to Tokyo. A mere 2 days after coming back from Ehime I am off on another adventure to Hokkaido and who knows where else. Honnestly, my friend and I haven’t really done any planning yet. We are going to figure it out when we get there. Travel as it should be. Not completely satisfied with the Tachikawa fireworks I visited my friend in Yokohama again to see the fireworks there. I went to Yokohama in the afternoon to do some of the things I didn’t get to do last time I visited. I met my friend at the station again and we started out by going for lunch at the Yokohama Curry Museum. I went to the Yokohama Ramen Museum a while ago so this time I wanted to eat some curry. I ate three kinds of curry all were pretty good. I especially liked the black one. 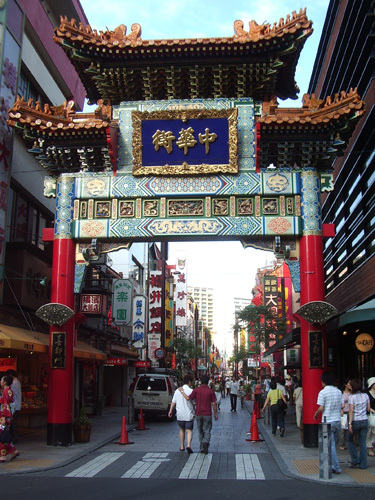 After curry we went to the Yokohama China Town. I was actually not too impressed with it. It was too clean and expensive. China Town is supposed to be dirty and full of Chinese people and cheap food. It was interesting, but I think I like San Francisco’s better. I still of course bought some Chinese sweets but at Japanese prices. After China Town we went to find a spot for the fireworks. There were a lot of people there and finding a spot was difficult, but if there are any spots - I am a master at finding them. We got seats almost front row with a nice view. The fireworks were also pretty nice except for an annoying pause between the sets of fireworks. After a nice show we took a long walk to the station and I took a long train back home. The Yokohama fireworks were nice but still not that great. Granted, they were big but since it is a big city they were slightly far away. 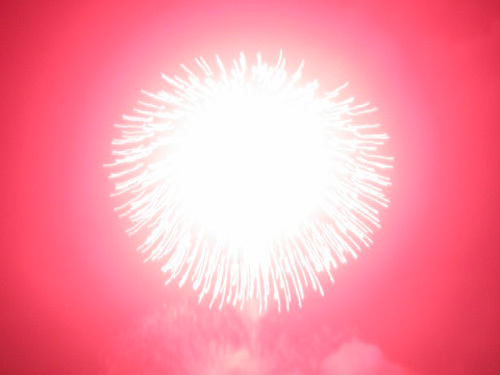 The next fireworks I was to see, in Ehime, was even better. More about that later. 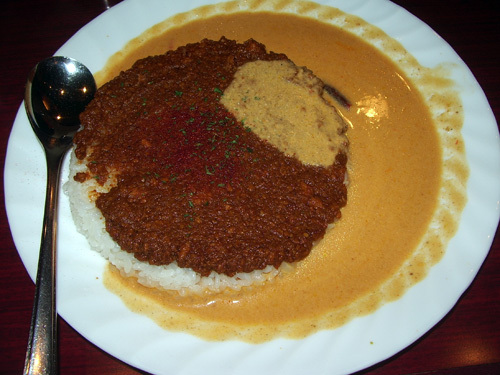 The first curry I ate. It was pretty good. 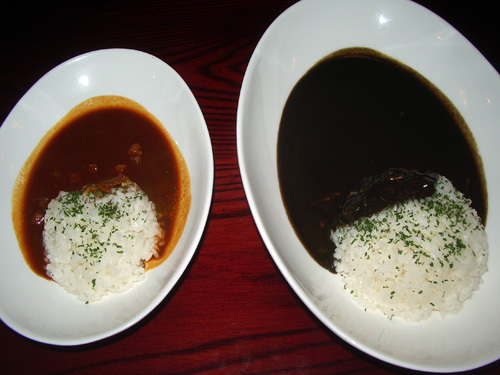 The black curry was strange but very good. 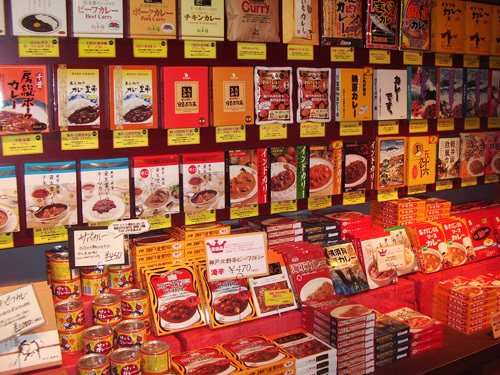 They had a lot of different curry available for sale in the shop. This is only a small part of the entire selection. 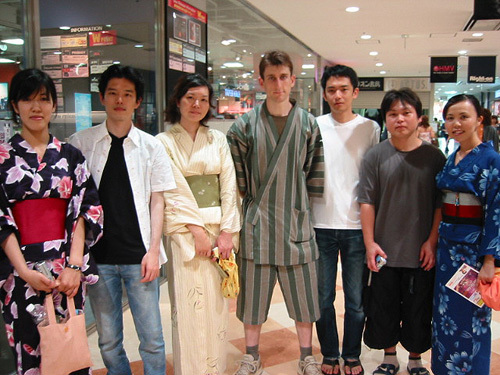 My in my cool jinbei and some of my other friends wore yukata. Busy Busy. 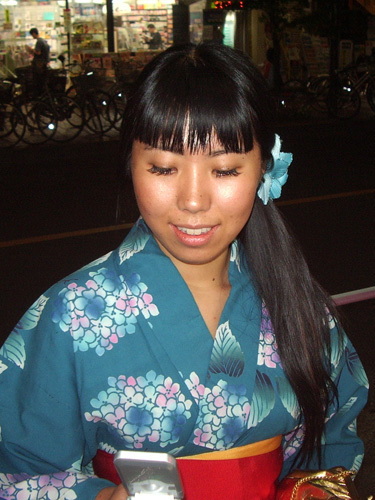 I went to fireworks in Tachikawa and took another trip to Yokohama, but the picturs will have to wait. I am now on summer vacation and will be leaving to stay with a friend in Ehime for a week. Expect lots of pictures when I get back. 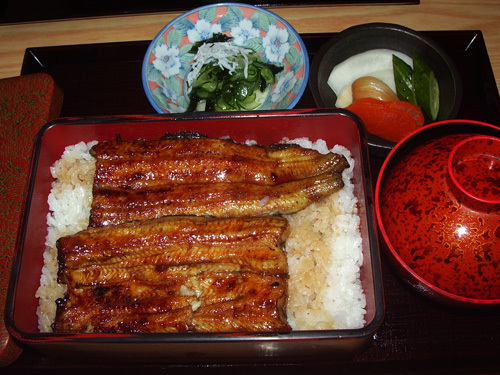 On July 28th it was again ‘Doyoushinohi’ or ‘Unagi day’ or ‘Eel day’. I learned about this holiday last year and had been looking forward to this day all month. But unlike last time I did it correctly this year and went to a really nice and delicious unagi restaurant with a co-worker for lunch before going to work. 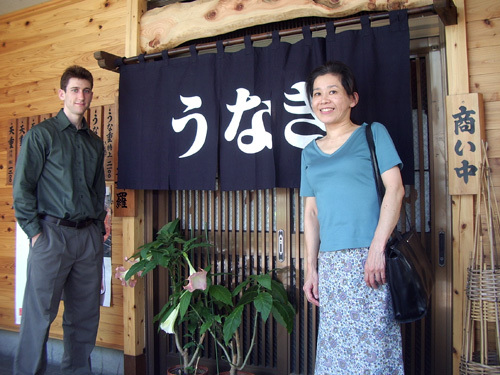 My co-worker and I at the unagi place. Checking out the menu… its pretty expensive here. Waiting for my unagi.. I dont like waiting.. this must be fresh unagi.. what are you looking at? Finally! Unagi. It looks so good. It was delicious. We ate every last bit. 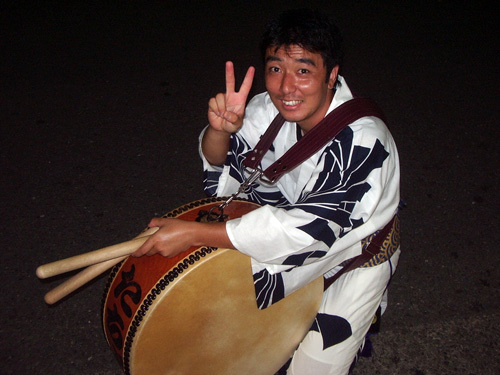 Saturday the 23rd I had a choice, I could either go to the Chofu Fireworks or the Koganei Awaodori. The original plan was to go to the fireworks, yet an unfortunate event happened after I left work. Tokyo had a fairly large earthquake. The unfortunate part was that I was on the train at the time so I did not get to experience it. Immediately after the earthquake hit the train stopped also unfortunately between stations, so I was stuck on the train for at least 40 minutes. Some of my friends were also affected by the event so we decided to go to the awaodori instead as it is in the same city and no transportation was needed. 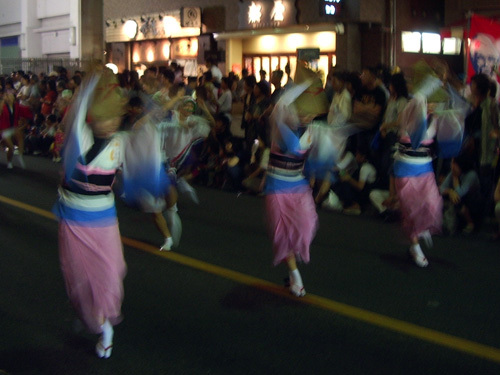 I went to the awaodori last year as well and was surprised at how different it was this year, yet also the same. 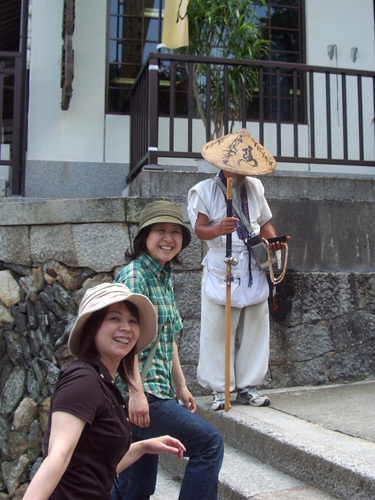 I also had a chance to wear the green jinbei I bought at the plum festival for cheap. There was the same awsome dancing as last year.